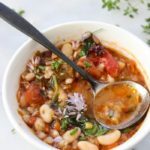 The best, vegan healthy cabbage and white bean soup recipe with Italian flair from white cannellini beans, tomatoes and herbs. 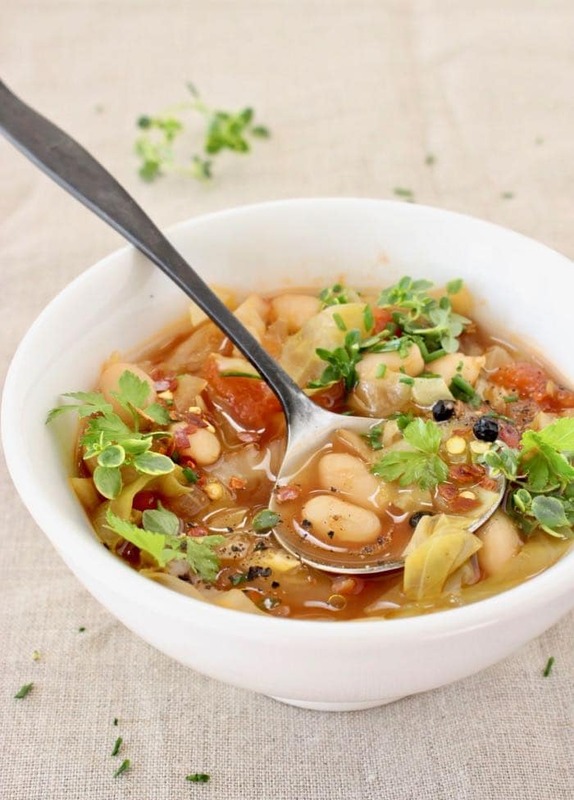 A simple soup to throw together on a cold winter day, to detox and to thrive on a weight loss diet all without sacrificing the delicious flavors. You can use onions or leeks as a base here, really whatever is in the fridge is getting used in this easy homemade goodness. Did I mention: ready in 30 minutes ?! 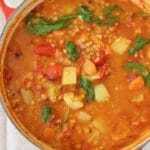 You can serve it as a hearty stew or thin it out into more of a soup with extra water or vegetable stock. I used a small head of green cabbage (you can use red, Napa or Savoy) and since it has a lot of natural sugars I would suggest taking it easy with the carrots in this recipe. Also you’ll need to balance out the flavors with a splash of apple cider vinegar at the end. Be generous with the herbs and spices. My favorite secret spice to use here is a good pinch of caraway seeds. Oh my! They compliment the cabbage and white beans like peanut butter and jelly, and add tons of flavor to your soup. Note: Add cooked quinoa or brown rice for a a spin on deconstructed cabbage roll soup, or shoot for a Cabbage Minestrone with lentils, mushrooms, broccoli or kale. 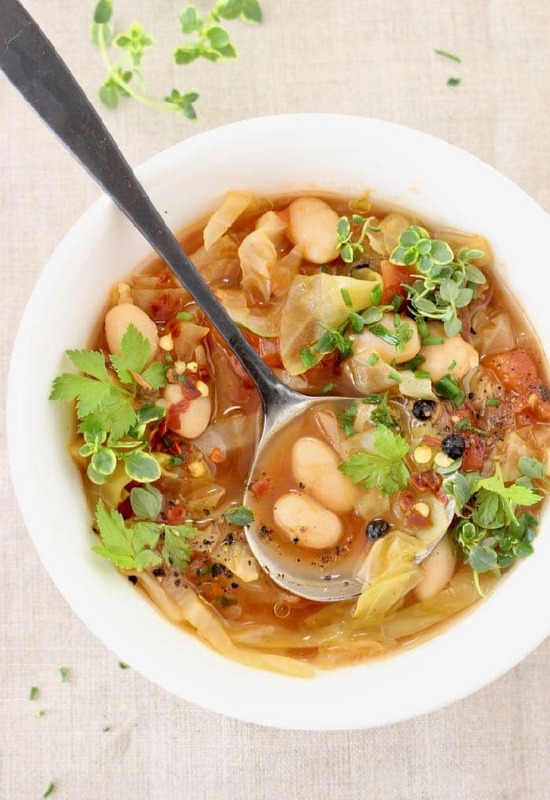 The best vegan healthy cabbage soup recipe with Italian flair from white cannellini beans, tomatoes and herbs. Heat up a large soup pot over medium low flame. Add the diced onion or leeks with a pinch of sea salt and a splash of water. You can totally go oil-free here and not miss a thing, I promise. Stir in the carrot, red pepper flakes and caraway seeds and cook everything together for about 5 minutes until the onion / leeks have softened. Add the shredded cabbage, bay leaf, peppercorns, dill and thyme, give it a stir and cook together another 5 minutes or so until the cabbage has softened. Pour in the tomatoes and water or vegetable stock and bring to a good simmer. Cook the soup for another 15 minutes. Taste and adjust seasonings with more sea salt and the apple cider vinegar. Meanwhile, rinse and drain the cannellini beans and add them to the cabbage soup. Cook a few more minutes until just warmed through. 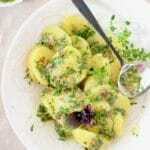 Serve hot, garnished with the fresh parsley, dill and chives, s or add cooked quinoa or brown rice for a more filling stew at this point. 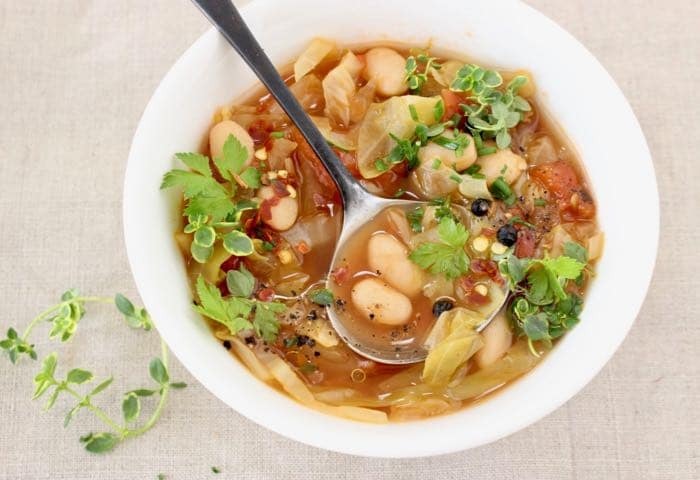 This soup always tastes best the next day as the beans and cabbage sit together in the broth with the herbs and absorb all those flavors. Makes great leftovers! Great soup! I made it last night in advance of dinner tonight and we had it for dinner. Amazing. Crushed red peppers were included in instructions, but not in ingredient list. I guessed and it ended up so very good. Wonderful, just wonderful. Thank you! Hello, I made this soup today, it was fast and easy! It looks very pretty with the fresh parsley added. Thanks for the great recipe.